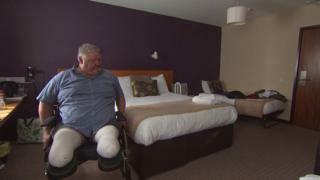 A double amputee has been living in hotel rooms for six weeks because no suitable accommodation is available. Tom Adams, 54, had a second leg amputation in December and was told his home was impossible to adapt for a wheelchair user. He spent five weeks in a Travelodge after being discharged from hospital in February and is now living in a room at a pub. Cornwall Council said it was working with Mr Adams to resolve his situation. Mr Adams, who is diabetic and had his first leg removed four years ago, spent two months recovering in hospital after the second amputation. He was then moved to the Travelodge in Camborne on 6 February before being given a room at Tricky's Inn in Redruth on 13 March. Mr Adams said: "I'm finding it very difficult. The height of the bed is awkward. "I've had two falls and damaged my left stump so I'm having medical care for that at the moment." Mr Adams said an occupational therapist visited his home in Camborne after the operation and decided it was impossible to adapt for a wheelchair user. He added: "My mental health is suffering because of just being stuck in all day and just looking at the four walls. "All I want is to be able to get somewhere and get on with my life. And I just want to get back to work as soon as I can." Cornwall Council, which has a responsibility for ongoing social care needs, said: "Sometimes, depending on an individual's circumstances - if they require specially adapted premises, for example - there may be a longer wait for suitable homes. "In such cases we'll support individuals by providing emergency accommodation until suitable property becomes available or adaptations can be completed." What will it take to unblock "bed blocking"?